One day you notice your baby drooling and eagerly chewing or wanting to put his or her hand and fingers into the mouth. Your good-natured baby becomes restless and fretful all of a sudden. Worry not, these behavior changes may only indicate that your baby is teething. What is teething in babies? Teething, the eruption of the primary teeth, is a normal part of development that usually occurs uneventfully. 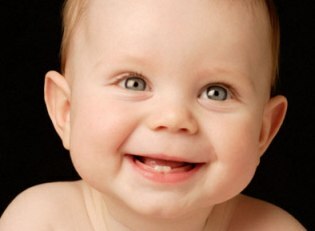 The process is generally painless or may cause little soreness in the gums that might make your baby fussy. Teething age starts when the first baby tooth erupts, usually at about 6 months of age but it may vary from 3 to 12 months. In the vast majority of infants, the first tooth to appear is the lower center front teeth and by around 20 months, your baby may get some or all of the primary teeth. There is no evidence linking fever, diarrhea and other systemic illness to teething. A fever during this time should be considered a coincidence rather than related to it, and should be consulted with your doctor. How do I ease teething pain naturally? Try to be supportive and available when your baby is in pain. When your baby’s gums are swollen, you can massage it with your finger for a minute or two. You can allow your baby to chew on damp washcloth or a clean, smooth, hard object like a chilled teething ring. Teething rings should be attached to the baby’s clothing, not tied around the neck as it might cause strangulation. Solid, silicone-based teething rings are recommended for the liquid ones may leak if damaged. Try not to use frozen objects which may cause frostbite. Do not offer any hard foods, like raw carrot, to your baby which may cause choking. Try not to give your baby teething biscuits which may contain lots of sugar. What are the other teething remedies? 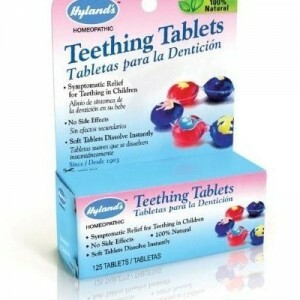 If your child is having extreme difficulty, the symptoms of teething may be treated with acetaminophen or teething tablets. You can also apply a non-irritating topical anesthesia (pain killer) or infant teething gel which may bring temporary relief. You can apply the anesthetic to the affected gum tissue over the erupting tooth 3 to 4 times a day. Several low-dose products specifically formulated for infants are available without prescription. Caution must be exercised because rapid absorption and toxic doses can occur if misused. Cases of seizures secondary to excessive absorption of the anesthetic have been reported therefore parents must clearly understand the importance of using the drug only as directed. According to the American Academy of Pediatric Dentistry, a child should have his or her first visit to the dentist for examination and oral health counseling approximately at the time of eruption of the first tooth (usually between 3 to 9 months) or by the age of 12 months the latest. When the child has special needs, this visit can be done earlier. The first visit to the dentist helps your child to be familiar with the dental environment, the dental staff and the dentist, which makes any future dental treatment less anxiety provoking. Cleaning and massaging your baby’s gums before the baby teeth erupt can help in the process of teething. You can wipe your child’s teeth and gums with a damp washcloth after feedings. A soft toothbrush moistened with water may be used after several teeth have appeared. When your child turns 2 years of age, toothpaste may be introduced but be forewarned that children of this age often swallow the toothpaste. A small, pea-sized amount should be used to minimize fluoride ingestion. Flossing should also be started when your child is 2 to 3 years of age. It is usually not necessary to floss your child’s teeth before this age because there is spacing between his or her teeth. 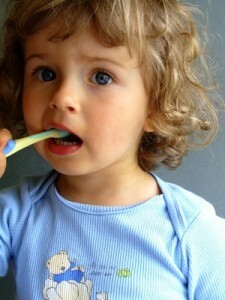 Parents should continue to brush and floss their children’s teeth at least once a day till the age of 6.